This past weekend, the families from Fukushima City who we have been taking to KEEP (Kiyosato) for short-term nature retreats, came to ASIJ for Winterfest and stayed in Tokyo for the weekend. There were 21 participants—7 mothers and 14 children from grades 2 to 8. As none of them had ever seen an international school before, let alone so many non-Japanese people all at once, it was a day full of surprises! We made a stop in Julie Lavender’s second grade classroom, where the children and mothers alike marvelled at the desks and layout of the room (very different from standard Japanese elementary classrooms). The families were later delighted to receive beautiful personalised Christmas cards made by Jessica Swist’s sixth grade art students. During dinner on Saturday night, lively conversation with the mothers drifted into topics that reminded me of just how much they continue to face by living in Fukushima City. They spoke of how haphazard the “decontamination” efforts are; one mother said that the pile of contaminated topsoil that was removed from her yard ages ago was finally taken away from her house recently. Another mother told us that the decontamination worker for her house arrived in a yakiimo (sweet potato) truck—pointing to the sad reality that such efforts are largely implemented by day laborers from different prefectures who have no specific training or knowledge of the decontamination process. Yet another mother said that her house probably had not been “chosen” for decontamination, so nothing has happened yet. ​On Sunday, we hiked up Mt. 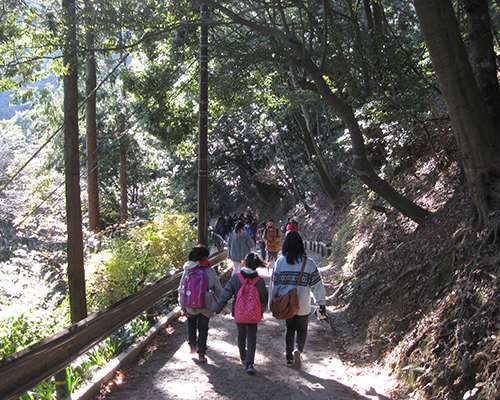 Takao and were blessed with perfect weather and fresh, crisp air. Mt. Fuji, Sky Tree, and Tokyo Tower were all clearly visable. Current high school student volunteers for this weekend project included Ikumi Miyazaki ’17, Sae Ishizuka ’17, Ayano Nagaishi ’17, Karen Kaminaga ’16, Mizuki Furukawa ‘1​5, and Ai Lena Tomioka ’15. We were also joined by ASIJ alums Michelle Stolle ’12 and Zac Oshima ’12.